Homeland Creamery is family owned and operated by the Bowmans. The milking herd has now grown to around 200 cows both Holstein and Jersey. The cows are milked with automatic milking machines three times a day. The cows are family too! Our cows are treated well and eat well, resulting in a healthier, happier cow and better quality milk. That makes us happier too! The most unique quality to our products is method in which we pasteurize. Most milk today is pasteurized under the HTST (High Temperature Short Time) Pasteurization method. Under this method, milk is pasteurized at 161 degrees for 15 seconds. This method allows milk plants to pasteurize more milk in a shorter period of time. 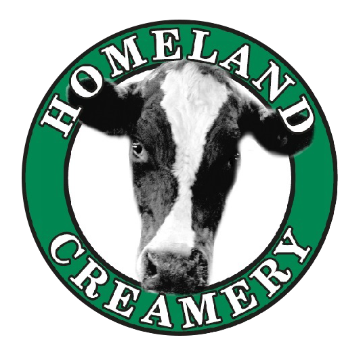 At Homeland Creamery, we know that you can’t rush flavor. Vat Pasteurization is one of the earlier methods used in cooking milk. This method heats the milk in batches at a lower temperature for about 30 minutes. During this method, a high percentage of the milk's natural enzymes and beneficial bacteria is retained which adds to the flavor and health benefits of the milk. Our Natural Approach to Farming helps You! Being sustainable means the way we farm helps protect our cows and the environment. Our barn is cleaned daily which makes happy cows. We use manure as natural fertilizer on our fields which makes happy crops. Because we spread manure on our fields, it attracts earthworms and other earth moving insects which do the cultivating for us. We also reuse water from our creamery to wash our milking parlor. Whether its a farm tour, or an afternoon ice cream adventure, we hope you can enjoy all that Homeland Creamery has to offer.